Orci collection. It's an exclusive collection, which is revamped every year, for a select extra-virgin olive oil. Skilled artisans hand-paint small terracotta jugs with colors and designs from the time-honored vase painting tradition in Apulia. These small, precious handcrafted vases contain a carefully selected oil with incomparable aroma and taste. The care lavished on the figures and decorations, and the refinement shown in the choice of colors, recall the meticulousness with which the Muraglia family supervises the extraction of this premium extra-virgin olive oil. Orci collection. It's an exclusive collection, which is revamped every year, for a select extra-virgin olive oil. 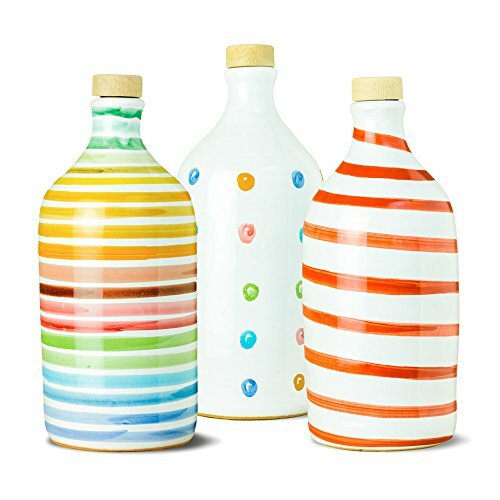 Skilled artisans hand-paint small terracotta jugs with colors and designs from the time-honored vase painting tradition in Apulia. These small, precious handcrafted vases contain a carefully selected oil with incomparable aroma and taste. If you have any questions about this product by Frantoio Muraglia, contact us by completing and submitting the form below. If you are looking for a specif part number, please include it with your message.